Bryan Berg has always been a card stacker. 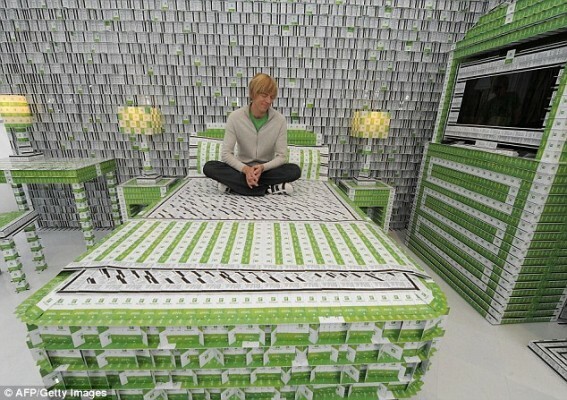 It should come as no surprise that when he was handed 200, 000 plastic key cards he built a mini Holiday Inn equipped with a guest room, lobby, and bathroom. The bed might not be the most comfortable thing ever, but it is life-sized (along with all the other furniture). 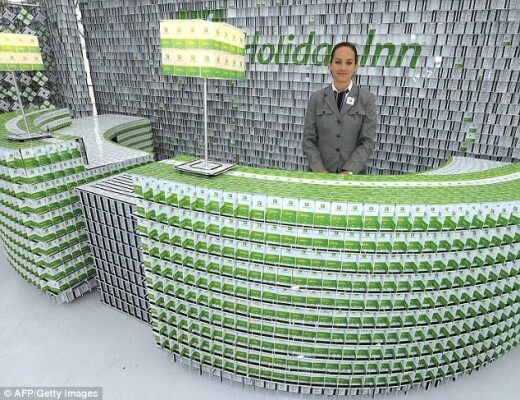 More than a construction made for shits and giggles (and pure skill), it also marks the relaunch of 1,200 Holiday Inn hotels globally. Standing at 4,000 pounds and 400 square feet, this is Berg’s largest structure to date. 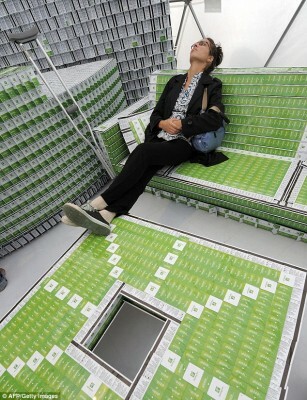 The key card hotel was displayed at the South Street Seaport in New York City from September 17 to September 21. In the midst of the madness that we call a key card hotel, Berg also constructed a 9 ft replica of the empire state building with playing cards in the hotel’s lobby. That’s a lot of cards to be stacking around. Excellent website. I appreciate your effort, I look forward to reading more of your posts. I want to thnx for the time you have put in composing this blog post. I am hoping the same top-quality post from you in the upcoming as well. In fact your creative writing abilities has inspired me to get my own blog now. Really the blogging is spreading its wings rapidly. Your write up is a good example of it. This post appears to recieve a large ammount of visitors. How do you get traffic to it? It offers a nice unique twist on things. I guess having something useful or substantial to talk about is the most important thing. Just in case you are searching for the best office cleaning london this particular internet site is definitely the actual right website. I am really enjoying reading your nicely written content articles. It appears like you invest a great deal of work and time on your blog. I have bookmarked it and I’m looking ahead to reading new articles. Maintain up the great work! I’m impressed, I have to say. Really seldom do I come across a blog that’s both informative and entertaining, and let me tell you, you’ve hit the nail on the head. Your article is outstanding; the issue is something that not many people are talking intelligently about. I am really happy that I stumbled across this in my search for something relating to it. Very good written information. It will be beneficial to anyone who employess it, including yours truly :). Keep doing what you are doing – can’r wait to read more posts. I appreciate all you who have sent emails. Resources just like the one you mentioned here will be very helpful to me! I’ll put up a hyperlink to this web page on my blog. I’m sure my visitors will discover that very useful. Looking at a number your articles I should discovered this specific 1 typically rather. I’ve got a blogging site also and wish to repost many snips of your respective content in my blog website. Would it be okay if I do that so lengthy I reference web site or generate a back-link to your posting I took the snip from? Otherwise recognize and would never do it with out having your acceptance . I have book marked this specific write-up to twitter along with zynga account for reference. Regardless several either way! This is my first time i go to here. I discovered so many entertaining stuff in your blog, particularly its discussion. From the tons of comments in your articles, I suppose I am not the only one having all the enjoyment right here! Keep up the good work. Can you message me with any tips on how you made this blog look this awesome, I’d be thankful. Wow this post totally shocked me thank you for the 411! Sometimes i wondering, how many times in my life i get hurt because i’m gay, and people don’t accept me for that. The content usually demonstrate myself that you really possess some advanced expertise about this. Quite a valuable read we must state. 2. Outstanding article over again! I am looking forward for more updates. It is unusual for me to discover something on the web that’s as entertaining and intriguing as what you have got here. Your page is sweet, your graphics are outstanding, and what’s more, you use reference that are relevant to what you are talking about. You are certainly one in a million, great job! I have study a couple of the posts on your blog these few days, and I really like your way of blogging. I added it to my favorites blog list and will be checking back soon. Please visit my web site too and let me know your thought. marvellous point. I am going to be checking out other pages to learn a bit more.